No fires may be lit or allowed to remain alight in the open air from 2am Tuesday, January 22, until 2am Wednesday, January 23. This applies to all outdoor fire, including incinerators, burn-offs, campfires, fire pots and wood-fuelled barbecues. Further Total Fire Bans will be declared in parts of the state on Thursday and Friday as forecast weather conditions will make containing existing fires and stopping newly-started fires extremely difficult. "This week our community needs to be prepared for some very challenging fire weather conditions," Tasmania Fire Service chief officer Chris Arnol said. "In spite of the enormous amount of hard work and success we have had to date, Tasmanians should be aware that any of the fires we currently have could break their containment lines and burn uncontrollably." "Forecasts from the weather bureau are indicating very high fire dangers in the north and south of the state on Tuesday with very high fire dangers extending across most of the state on Thursday and Friday. "These forecast conditions are going to put our current containment lines under great stress, and with a number of fires still uncontrolled the likelihood of fires escaping is very high. I want to stress that the last thing we need is any new fires starting as this will place a huge burden on our resources. "While we have had success containing these fires with aircraft and ground crews there comes a point where a fire will burn out of control despite our best efforts. TFS is well resourced and we have robust plans in place to mitigate the impact of these fires should they take a run but all of us need to be prepared. "Property owners must ensure their property is clear of long grass, twigs and leaf litter as these fuels spread fire quickly. You should review your Bush Fire Survival plan and if you don't have one you must plan for what you will do if there is a fire near you. 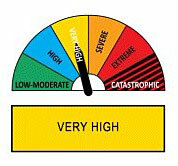 "If your home is not well prepared for a bush fire then leaving early is your safest option. Fires are everywhere in Tasmania right now. If you are spending time in the bush over the weekend you must be aware of the local conditions, stay up to date through the TFS website and listen to ABC local radio if there is a fire near you," Mr Arnol said.